The Canon 17-55 IS USM was announced on 21-February-2006. The weight of the lens is 645g (22.75oz.) while dimensions (diameter x length) are 83.5mm x 110.6mm (3.3 in. x 4.4 in.). Since the 17-55 is not an L lens, how’s the build quality? Granted, the Canon EF-S 17-55mm f/2.8 IS USM lens does not have the metal exterior that the L-designated Canon EF 24-105mm f/4L IS USM has. But David Tomic is of the opinion that the overall build quality is VERY good. Having a metal barrel will make the 17-55 even heavier, and it already weighs in the same as the 24-105 lens. Additionally, what percentage of Canon shooters actually need the weight and durability of a metal construction? Therefore, it can be concluded that the 17-55 is more than adequately built to be put through the rigors of normal lens use. David also shares a portrait taken with the 17-55 at 24mm, f/2.8, 1/13sec, flash used, handheld, and says that optically, the 17-55mm easily meets, and often exceeds the output of any L lens in the same range. cubsfan61 forum thread starts off with downsized high ISO shots (ISO1600, ISO3200 and ISO6400, taken with the T2i / 550D) of the T1i / 500D. These photos are out-of-camera JPGs with no post-processing. Next, a comparison of high ISO photos pitting the T1i against the new T2i, followed by full-resolution images. 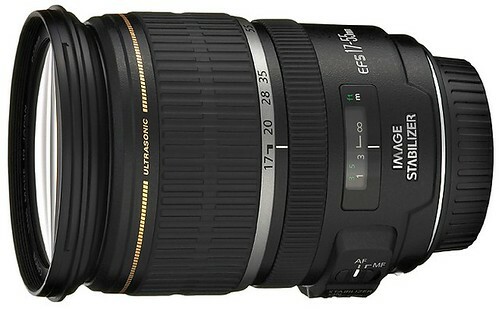 The Canon EF-S 17-55mm f/2.8 IS USM lens used for the images. Official portrait sample taken with a Canon EOS Rebel T1i / 500D / Kiss X3 digital SLR camera. Night portrait, photographed with a Canon 50D. Random images from user galleries on PBase.com. Don’t forget to hit the refresh button on your browser to serve up another set of random pictures. You’ll also find user reviews there. Just one example, this interior photo (shot with a Canon 30D) is a great example of the kind of wide-angle, indoor image you can get at 17mm with this lens. Check out the link in this forum post to a very impressive, full-sized, ISO3200 night scene image taken * hand-held * at 1/4 sec (the image stabilization seems to have been effective here), f/2.8, with the Canon EF-S 17-55mm f/2.8 IS USM lens mounted on a Canon 20D digital SLR camera. The filter thread size on the 17-55 IS is 77mm, which means you’ll want to be looking at 77mm filters. One item Canon deliberately left out from the package is the EW-83J lens hood which is absolutely necessary to prevent flare from appearing in photos when shooting with the lens facing in the general direction of the sun. Official Canon 17-55mm page at Canon USA.